In February, I wrote Part I in a series on Beginning Color Theory for Non-Artists, directed primarily at the 'makeup' crowd, however, it can prove useful to just about anyone wanting to understand color combinations a bit better. In the first installment, I introduced my "color wheel" (The Wheel o' Piggiez!) and defined primary, secondary and tertiary colors. In this installment, we're moving on to some of my favorite color combos (in painting AND in makeup), analogous colors. pigments by Madd Style Cosmetics except red (by MAC). 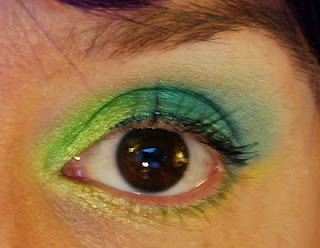 Analogous colors are an easy way to achieve a perfectly blended look with your colors. Since each color is made using a little bit of the next one, they really can't help but blend together. You can achieve a great effect with just two analogous colors, so don't feel compelled to start off with four or five. Now go have some fun!